I recently found my MSI Wind U100 Netbook out and thought as Windows 10 is currently a free upgrade for Windows 7 and Windows 8 user i’d give it a try and see how well it runs on the MSI Wind, a 7 year old netbook. 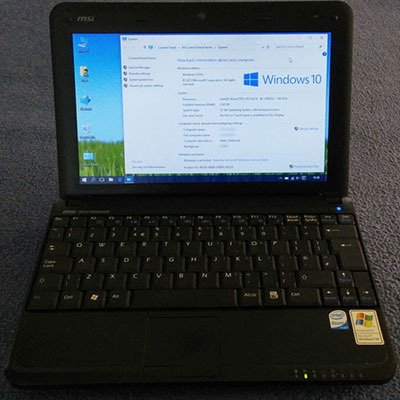 The MSI Wind U100 is a netbook (small laptop) that I purchased in 2008 which got me though my second and third years of University. Back then thin / small laptops such as the Macbook Air didn’t exist. However in mid 2008 “Netbooks” became the next big thing in the computing world. These were essentially small / light laptops with a 9 or 10″ screen powered by an Intel Atom Processor. The Intel Atom was really power efficient at the time, which allowed netbooks such as the MSI Wind U100 to have a 6 hour battery life. Back then i remember thinking this was amazing, previous to that your average laptop was 15″, big, bulky and you would be lucky if you got more than three hours of battery life out of it. I remember taking my 15″ Acer Ferrari 4000 laptop to University a couple of times in my first year. I quickly concluded it wasn’t a viable option, although it would fit in my bag, my back and neck hurt from carrying it around all day as it was just too heavy. Even at the time the MSi Wind U100 wasn’t a powerhouse, however connectivity / portability and battery life was where the MSi Wind U100 excelled, that was exactly what i wanted. It could run Microsoft Office 2007 (later 2010) and browse the internet perfectly fine, all i needed to get through my University day. In addition the MSI Wind U100 had great comparability with other operating systems. When i first got the MSI Wind I ended up with a quad boot setup consisting of Windows XP, OSX, Ubuntu and an early beta build of Windows 7. Early alpha versions of Google’s Chrome OS worked well from the SD card. Eventually when Windows 7 was released i got rid of my quad boot setup and simply stuck with Windows 7 as it worked even better than Windows XP which the laptop shipped with, something which surprised me. Windows Vista didn’t run well at all on the Intel Atom based processors. This sort of leads me on to this blog post, I thought as Windows 10 currently available as a free upgrade i’d see if it was even possible to run Windows 10 on my MSI Wind U100 and how well it worked. As i had Windows 7 Ultimate installed on the MSI Wind at the moment i downloaded the EN-GB version of Windows 10 Pro from Microsoft’s Tech bench website. As the MSI Wind doesnt have a DVD drive i simply extracted the contents of the ISO with WinRAR and started the upgrade process. The Windows 10 installer did its thing, when i came back to the MSI Wind U100 about an hour later I was prompted to create a user count. It took a while to set things up after that and end up at the desktop, shortly after the drivers for the GPU were automatically installed. I than ran Windows Update and the most recent updates were downloaded. I’d honestly say Windows 10 works as good as Windows 7 on the MSI Wind U100, it boots up in around 30 seconds and is ready to use. Microsoft Office is as usable as it ever was on Windows 7 and my day to day applications all work fine. Microsoft’s edge struggles a bit when loading webpages that contain flash adverts, however flash content was never that great on the MSI wind anyway! I remember thinking when buying the MSI Wind U100 that the Intel Atom N270 only been a 32bit processor would limit the ability to upgrade to more modern operating systems in the future. However back in 2009 I was pleased to hear Windows 7 would still have a 32bit version, however fast forward 6 years later and the 32bit version of Windows 10 also works perfectly on the MSI Wind U100. Not bad at all for a £280 Netbook i purchased 7 years ago, the MSI Wind U100 just seems to keep going. I hope my experience of upgrading to Windows 10 on the MSI Wind U100 might be useful to someone else, I don’t think i’d personally pay to upgrade to Windows 10, however for free during the first year you might as well. For basic internet / office use the MSI Wind is still very much usable in 2015. Thanks for sharing! You a not the only one considering using the “old”, but still useful MSI Wind. Are you satisfied with the performance when using Word, Excel etc. while e.g. downloading? Yes Word / Excel 2010 works as good as they did on Windows 7 for basic use. I’m spoiled by having an SSD in all my other devices, however if you were happy with the Wind running Windows 7, you will be just as happy with it running Windows 10. For browsing the internet you might want an ad-blocker, as flash adverts really do strain the Wind. However the latest Google Chrome (Version 45) doesn’t play flash content by default, which should help a lot if you don’t wish to block adverts. If you were to replace the Winds hard drive with an SSD I imagine you would notice a nice performance increase too. Hey, I have an MSI Wind too and I fond your article really itneresting. Do you think it would worth it to replace the HDD with an SSD and to upgrade the RAM now ? I upgraded my MSI Wind to 2gb of ram when i purchased it all those years ago, that’s the max amount of ram the MSI Wind will take. If you only have 1gb of ram it will certainly help a lot upgrading to 2gb of ram. I remember that making a big difference when running Windows 7 compared to a friend who had a Netbook with only 1gb of ram. As for a SSD the difference is massive even in an old PC, i’d certainly imagine you would notice a nice improvement with an SSD in the Wind too. If you do upgrade your Wind to an SSD do let me know how it goes. I upgraded to 2gb RAM and later a SSD. Both upgrades has boosted performance (and of course boot time). can you see youtube video on u100 with windows 10? i have the same on Seven and the video are not good on youtube. processor are fulled charged during video. You can play 480p YouTube video fine, however the processor usage is very high and the MSI Wind will become unresponsive when playing the video if you try do anything else. It’s usable, just not the best YouTube experience ever. Thanks so much for posting, considering doing exactly this upgrade myself! hello I have an MSi wind netbook that originally came with windows xp. I upgraded it to windows 7and it worked perfect. however I decide to go for windows 10 so I did the upgrade, and now I’m having trouble with it because the wireless adapter is off and wont turn on. I already tried updating itand it says it is up to date. . what would u recommend for me to do now? please help me out sir!!! All you probably need to do is hold the FN key then press F11 to toggle through the various wireless modes. This is indicated by the lights in the bottom right of the Wind. Got it thank u very much. Just searching on Windows Update found all the drivers for me. I managed to get the 1024×600 screen resolution out the box. Same here, built in drivers in windows 10 drove display without issue. Hi Matt. Thank you for sharing your experience with Windows 10 and U100. I have the same netbook with 2 gigs ram and I upgraded to an SSD last year. It came with XP and have been using various Linux distros on it for years, so no free Win 10 upgrade for me. Debating whether it is worth paying for Win 10 or not. Do you know what recent Linux distros work well on it? I wouldn’t have paid for Windows 10, however that’s because i dont really use the MSI Wind any more. It really depends what you actually want to do on the Wind? You are essentially limited to a web browser as that’s what ChromeOS is all about, doing things in the cloud. It’s extremely light weight and responsive however. Online versions of Microsoft Office which handle basic editing tasks just fine would compliment CloudReady pretty well. 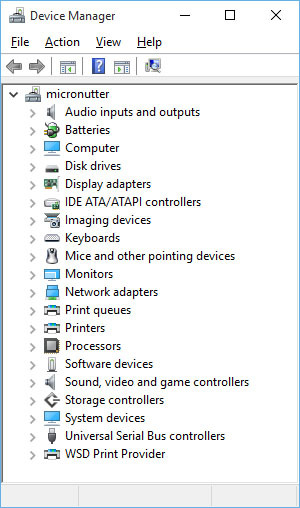 what driver / device does Win 10 use for the built-in webcam? I did a clean install of Win10 32bit and it didn’t detect the camera. Using Fn+F6 does nothing to turn it on or off either. 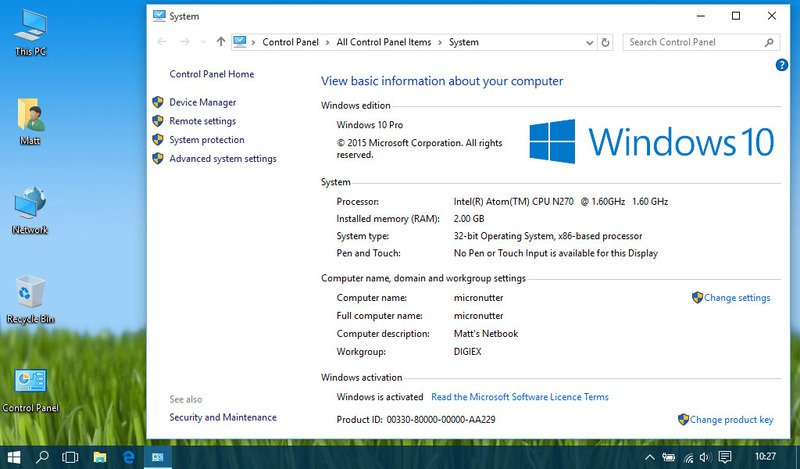 It’s OK, I got it to work, Boy, even with 2Gb of RAM Win10 32bit is as slow as hell compared to Win 7 32bit. Even with all the crap disabled, it’s still tedious to use. Oh well, got plenty of good usage from it. 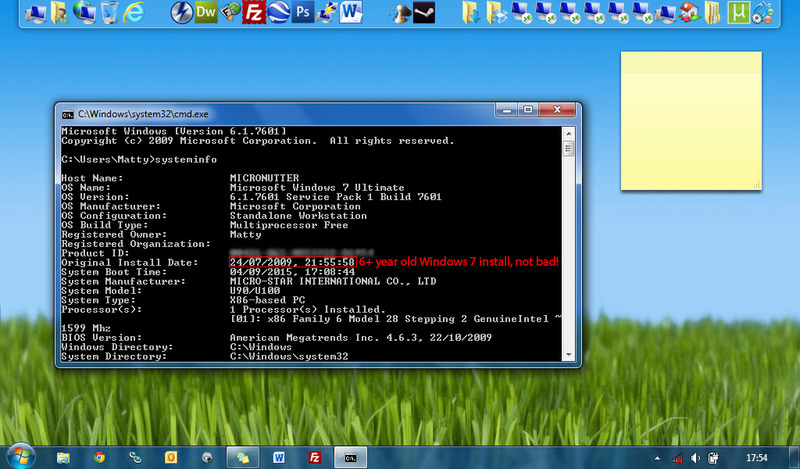 Hey, can someone tell me step by step how to upgrad my u100 from Windows XP to 7? You would be better buying a digital download of Windows 10: https://www.microsoftstore.com/store/msusa/en_US/pdp/Windows-10-Home/productID.319937100 Windows 7 is end of life, so Windows 10 would be a better investment. You can create a usb drive to install Windows 10 from using the download tool, or purchase Windows 10 on a USB drive.